One of the most powerful weapons to win the migration war is to produce significant and detailed reports both before and after the migration. You need good reports before you even start the migration process to plan your effort, size your team, and provided a reasonable set of deadlines. You need them after you run the conversion software on a given VB6 project because you need to estimate the time needed to fix each individual compilation error and migration warning. Assessment report – in the form of a customizable Excel spreadsheet that allows you to estimate the time and money needed to fix all migration warnings. XML report – list of migration warnings and compilation errors in XML format, which is then easily imported in external program for further analysis, converted to HTML using a custom format, and so forth. For a thorough description of each report, please read our “Migrating a VB6 application in 10 easy steps” whitepaper. We are aware that the value of reports is even greater to companies who offer migration services based on our VB Migration Partner, because a comprehensive report is essential to prepare a detailed offer for the end user. 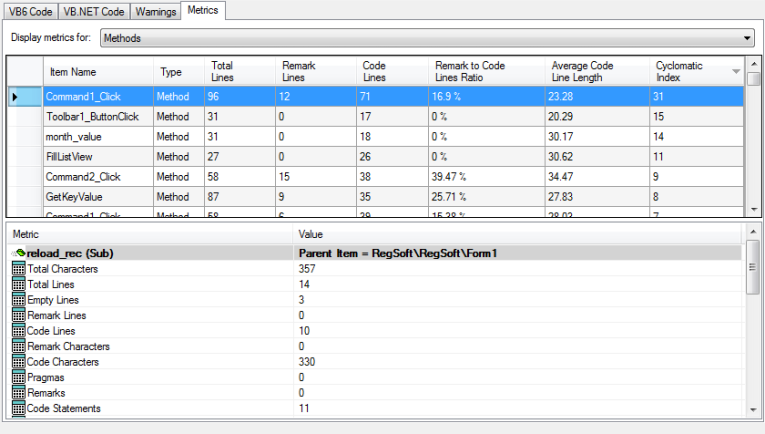 For example, XML reports can be run in batch mode over all the VBP projects that make up an application. One of our largest customers is migrating an application with 1200+ projects, thus this report is a real lifesaver. The beauty of XML reports is that they are produced by means of an extender DLL, written in plain VB.NET and whose source code is freely available to all registered users. Unlike other VB6 migration tools which are based on proprietary languages, VB Migration Partner can be easily extended by any .NET developer. This feature allows any developer to easily create custom reports that contain exactly the information they need. Recently, one of our customers asked to extend XML reports to include code metrics and thus provide a mix of the last two report types outlined above. Well, it took less than one hour to tweak the extender’s source code and have the job done. This is what we mean by ease of customization.